You should find this UFO case a compelling story, it has multiple police witnesses, U.S. Air Force and Government Cover-up, Steven Spielberg, The Pentagon, Congress, The Secretary of Defense and National Press all very involved in this unique case. The Portage County UFO Chase was an unidentified flying object encounter that began in Portage County, Ohio on the morning of April 17, 1966, when police officers Dale Spaur and Wilbur Neff observed a metallic, disc shaped object flying in the skies. They pursued the object for about half an hour, ending up in Pennsylvania before losing sight of the UFO. Several other police officers became involved in the chase, and several civilians reported witnessing the same object, or a similar object in about the same area, during this time. The UFO encounter earned significant mainstream publicity, and probably inspired a scene in Steven Spielberg's Close Encounter of the Third Kind, where three Indiana police cruisers are depicted chasing several UFOs into Ohio, eastbound across state lines. After interviewing one of the police witnesses, Project Blue Book (the official UFO investigative arm of the U.S. Air Force) determined that the witnesses had chased a communications satellite, then the planet Venus. This conclusion was rejected by the officers involved as ridiculously inadequate, and was furthermore subject to some wider criticism, contributing to the opinions of some observers that Blue Book was a failure as an investigative project. The UFO chase was one of the cases that contributed to the creation of the Condon Committee, ostensibly an independent scientific investigation of UFOs. Shortly after 5.00 a.m., Spaur and Neff had stopped their police cruiser to investigate a car seemingly abandoned off the side of road near Ravenna, Ohio. Earlier, there had been police radio chatter about witnesses in and near Akron, Ohio who had telephoned police with claims of seeing a large, bright disc flying through the skies. While examining the abandoned car, Spaur noticed a bright light seeming to approach from behind a nearby hill. Alerting Neff, they both watched as the light came closer. They reported that the light came from a large, oval shaped object that hovered at between 50 and 100 feet in altitude. The object then turned sharply and shone an extremely bright light at the officers. The oval was about 35 to 45 feet in diameter, said Spaur and Neff, and seemed to be about 18 to 24 feet thick. The bottom was rounded, and they could not see much of the object's top due to their position below the object. A bright conical spotlight shone from the bottom of the object. According to Spaur and Neff, whenever the object moved, its edge would tip in the direction of its motion. Spaur and Neff said that the object then rose in altitude to about 300 feet, and began to emit a loud humming sound, as its light grew ever brighter. It began slowly drifting through the air, its spotlight shining brightly on the ground as it moved, and Spaur and Neff followed in the police cruiser. However, the object would accelerate away from them whenever Spaur and Neff approached. Deciding to follow the object, Spaur and Neff radioed their intentions to the police dispatcher. Via the radio, Deputy Robert D. Wilson suggested that Spaur should shoot the object, but Spaur refused. The chase continued, mostly in a southeasterly direction, and soon Spaur and Neff entered Mahoning Country, Ohio. They traveled along U.S. Route 224 at up to 100 miles per hour, in radio contact throughout. As the sun rose, Spaur and Neff said they could better discern the object's shape: it seemed to be metallic, resembling aluminum or silver, and the top was a flattened dome. There was, Spaur and Neff asserted, a slender projection at the rear-center of the object; they called this the object's "antenna". Curiously, Spaur and Neff said that if the police cruiser had to slow for traffic or road conditions, the UFO too would slow, as if it were waiting for them to catch up with it. They related this observation to others via radio. By now, police officers in three counties had overheard the radio discussion of the UFO chase. Patrolman H. Wayne Huston (of East Palestine, Ohio) realized that Spaur and Neff were traveling in his direction. Via radio, he told Spaur and Neff that he would join the pursuit. The police officers asserted that the object was usually one-half to three-quarters of a mile ahead of them. Huston would later describe the object as initially appearing from a distance to be somewhat conical in shape -- resembling a flattened ice cream cone due to the beam of light shining from its underside (the "ice cream cone" description was echoed in Close Encounters). The three officers crossed over into Pennsylvania, near Rochester. Though he was trailing the others, Huston was guiding the chase now, as he was more familiar with the area than Spaur and Neff. Nonetheless, near Route 51, the two police cars had to slow nearly to a stop due to traffic, and they lost sight of the object. A few minutes later they insisted that they spotted it again. Spaur, Neff and Huston resumed their pursuit. At about 5.30 a.m., Spaur and Neff received orders to abandon the chase. They were far from their jurisdiction, and their car was nearly out of gasoline. At about 5.20 a.m., another police officer would become involved in the case. Patrolman Frank Panzanella of the Conway, Pennsylvania police was on patrol, when he saw an object shining in the skies. Initially, he thought it was the reflection of light from an airplane. However, the object seemed to be stationary. I saw 2 other patrol cars pull up and the officers [Neff, Spaur and Huston] got out of the car and asked me if I saw it. I replied SAW WHAT! Then pointed at the object and I told them that I had been watching it for the last 10 minutes. The object was the shape of a half of a football, was very bright, and was about 25 to 35 feet in diameter. The object then moved out towards Harmony Township approximately 1,000 feet high, then it stopped then went straight up real fast to about 3,500 feet. As the UFO ascended, the police officers saw the moon in the sky above it, and saw what they would later describe as a bright "star" very near the moon. That morning, the planet Venus was very near the moon rising in the east, and the men had spotted the planet without knowing it. With the object still hovering at about 3,500 feet, Panzanella radioed dispatcher John Beighey at Rochester, asking him to contact the Greater Pittsburg Airportt (GPA). Panzanella says he saw an airliner pass below the object as it hovered; he related this fact to Beighey. Minutes later, Panzanella saw what he took to be fighter jet vapor trails to the west or northwest of the object, and that a voice on the police radio announced that jets had been scrambled to intercept the object. Shortly thereafter, the UFO sped upwards at high speed until it was lost to view. Druffel writes that the air traffic control tower at GPA "confirmed that the object was being observed on their radar screen." 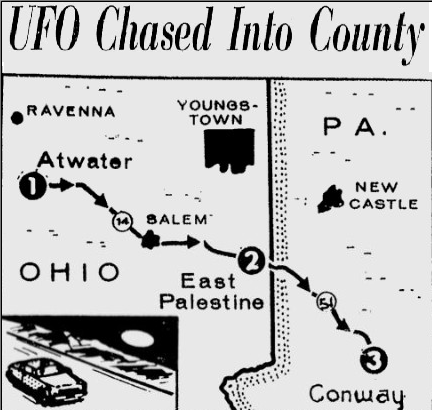 Spaur, Neff and Huston then began their return trips to Ohio, while Panzanella elected to stay where he was in hopes that the UFO might reappear. Only a few minutes later, however, Beighy radioed Panzanella to report that officials wanted to interview all who had witnessed the UFO. Panzanella caught up with Neff and Spaur to relate the request. Spaur, Neff and Huston then went to police headquarters in Rochester, Pennsylvania. The men all seemed shaken and distressed; Druffel writes, "Spaur, who was normally well-poised, stuttered when he spoke, and his hand trembled as he smoked a cigarette." Spaur spoke briefly on the telephone to a man he later described as "some colonel," whose identity remains unknown. Despite Spaur's protests, the colonel tried to persuade Spaur that they had misidentified some normal object, then told the men that he'd forward their accounts to personnel at Wright-Patterson Air Force Base, headquarters on Project Blue Book. The colonel did not speak to either Neff or Huston. Just before Panzanella caught up to Neff and Spaur, he spoke on the radio to Patrolman Henry Kwaianowski of Economy Bourough. Kwaianowski insisted that, for two or three minutes, he had observed a metallic, football shaped object at the same altitude as two passenger jets. Two Salem, Ohio police officers, (Lonny Johnson and Ray Esterly) had overheard the radio traffic, and suspected that, given its direction of travel, the UFO might pass over Salem. After looking in the directions reported by the other officers on the police radios, Johnson and Esterly say they spotted the object shortly after 5:30 a.m. They said the object was at between one and three miles away from them, and at about 10,000 feet, at the same altitude as a passenger jet. They claim that they saw two smaller jets approaching the UFO from about 10 miles away. They radioed their observations as they occurred, then when the UFO and the three jets disappeared from view, Johnson and Esterly returned to their headquarters. Clark notes that the claims of Johnson and Easterly contradict, in many particulars, the claims of the other police officers. He quotes William Wietzel, a philosophy instructor and NICAP investigator who speculates that there might have been two similar UFOs in the area (in Close Encounters, four UFOs are depicted in the chase). It's also possible that the three officers who came from Ohio had a chance to "unify" their perception of the UFO during the chase, and/or that there might have simply been an honest disagreement about the altitude and vector of the object. Several civilians claimed to have seen the same or a similar object on the day of the UFO chase. Most of these claims were reported in local newspapers. NICAP members interviewed some of them, but none of the witnesses were known to have been interviewed by U.S. Air Force investigators. In Bentor Harbor in extreme southwestern Michigan, in the early morning hours of April 17, three garbage men making their daily rounds reported seeing an unusual object hovering over a hotel and emitting a light so bright that they insisted they "couldn't look straight at it." They notified police, who arrived in time to see the object shortly before it flew away. Sometime between 5.00 and 5.30 a.m., two couples together in a car driving near New Castle, PA reported seeing a bright light moving in the sky. Initially thinking that it was a reflection from an airplane, they stopped the car to get a better look. The object stopped when their car stopped. They quickly became convinced that it was no normal aircraft, due to its shape, which one witness described as resembling an "ice cream cone" (though another witness thought it looked more like a "hamburger". The object began to move again, and the witnesses followed it in their car for a few minutes before the object accelerated out of view. This account received very sketchy reportage, with the witnesses unsure of the precise time they saw the object. Clark noted that some interpreted this encounter as a second UFO in the same area, though he also notes that, without a firmly established timeline, this interpretation is speculative. Thelma James of Newton Falls, Ohio claimed to have seen an unusual aerial object. She had woken at about 3:50 a.m., and unable to sleep, looked out her bedroom window. She saw a bright light slowly ascending in the sky. Clark notes that this was almost certainly the planet Venus, which, from James's perspective, would have risen above the horizon at 3:35 a.m. However, at about 5:15 a.m., Jones noted that a second light, much brighter than the first, had also appeared in the sky, but closer to the horizon, and to the southeast of Venus. This second light seemed to be crescent shaped, and was a very bright yellow color. It continued moving through the sky and was lost to Jones's view at about 5:30 a.m. James's observations match some of the observations made by the police officers in the UFO chase. 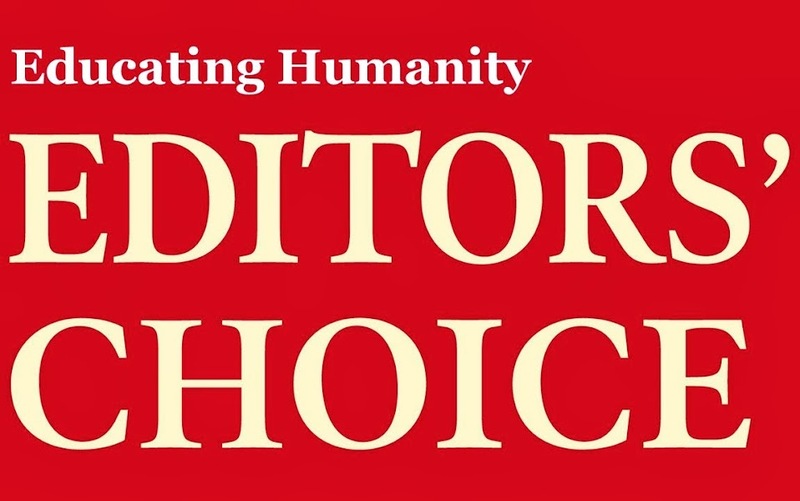 Clark writes, "...it is unfortunate that none of the investigators interviewed this witness, who saw both Venus and the UFO--in defiance of those who would soon insist that the two were one." On the other hand, the rise of Venus and a crescent moon that morning, and the subsequent glare of sunrise, neatly account for these observations. Within hours, the UFO chase had earned attention in the press (several reporters are presumed to have overheard the police radio conversations on scanners), and the chase would later earn widespread mass media attention. William Weitzel of NICAP began his investigation after hearing an early morning radio report the day of the chase. He began making telephone calls that morning, hoping to track down witnesses. 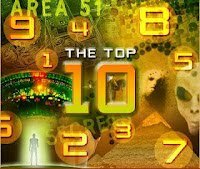 Within a few weeks, he or his NICAP associates had interviewed all the police officers named above, as well as several other police officers who had figured in the UFO chase, either as dispatchers or as those who had overheard the radio communications. NICAP members also interviewed some civilians who had claimed to have seen a UFO at the same time of the chase and/or had monitored police scanners. Though Neff, Spaur, Huston and Panzanella asserted that they'd heard radio confirmation that the UFO was tracked by radar at the GPA, officials at the airport would deny that such an event had ever occurred, and that such a statement had been made via radio. William T. Powers of Northwestern University (a peer of J. Allen Hynek, the scientific consultant for Blue Book) telephoned Spaur on the evening of April 17. After their 20-minute conversation, Powers did some research, and thought that Spaur might have misidentified the planet Venus. Though he related this conclusion to Major Quintanilla of Blue Book, Powers would subsequently dismiss this explanation as inadequate; see below. U.S. Air Force investigators began their work on April 18. Initially they telephoned local news outlets, seeking information. However, local newspapers and radio had only vague outlines of the case. Air Force investigators also interviewed meteorologists and weather agency personnel, hoping to learn that a weather balloon had been launched in the area during the UFO chase. They learned that there had been no weather balloons launched that morning, and also that the wind had been so mild that the police would have had no difficulty catching up with any wind-borne object. Later that same day Major Hector Quintanilla (then the head of Blue Book) telephoned Spaur. According to Spaur, after a few preliminary introductions, Quintanilla's first question was "Tell me about this mirage you saw." Spaur insisted he had seen no mirage, but a clearly defined metallic object maneuvering at very low altitudes. When Quintanilla asked if they had seen the object for more than a few minutes, Spaur asserted that he and Neff had chased it for over half an hour, and that Huston had seen the object for much of that period, and that Panzanella too had witnessed the object. Quintanilla then, as Spaur said, "kind of lost interest ... That's all he asked me. Hell, I talked longer with that colonel Sunday morning, and he didn't ask much." A day or two later, Quintanilla telephoned Spaur again. He asked if Spaur was sure that he had seen the object for more than a few minutes; again, Spaur insisted that he had. That was the extent of their second conversation. Quintanilla interviewed only Spaur; he did not interview any other police officers that claimed to have seen the object, and Quintanilla did not interview any of the civilian witnesses. On Friday, April 22, Quintanilla announced Blue Book's formal conclusion in a press release. In Blue Book's opinion, The police officers had first chased an Echo communications satellite, then, after it had disappeared in the southeastern sky (at the time the officers briefly lost trail of the UFO near Rochester, Pennsylvania), the police had then chased the planet Venus, believing mistakenly that it was the same object as the satellite. What the officers thought was the object's maneuvers was in fact an optical illusion, according to Quintanilla, caused by their excitement and high speed of travel. That same day, Quintanilla related this conclusion via telephone to Portage County Sheriff Ross Dustman (Neff and Spaur's superior officer). Dustman said he "laughed out loud" after Quintanilla had finished his statement. Dustman was later quoted in a UPI story, stating that he rejected the Air Force assessment: "I go along with my men. It was not a satellite and it was not Venus. I've seen Venus many times, but I never saw Venus 50 feet above a road and moving from side to side..." The police officers involved in the chase also rejected the Air Force's conclusion as absurd. Spaur said to Weitzman, "I don't know how much investigation [the air force] made, but evidently it wasn't a lengthy one, or it didn't involve me. First of all, I don't think that we have a satellite that can go this low ... I'm definitely sure I wasn't chasing Venus or observing Venus running wildly over the countryside. I'm not quite that bad off." Weitzel thought that Quintanilla's explanation was preposterous and illogical. When he learned that Ohio Congressman William Stanton had expressed an interest in the UFO chase; Weitzel wrote him a detailed letter, outlining what he saw as the inconsistencies and shortcomings of Quintanilla's hypothesis. Portage County Judge Robert E. Cook (an acquaintance of Spaur and Neff) also wrote Stanton, defending the police officers' judgment, and characterizing the Air Force investigation as "grossly unfair" to Spaur and Neff. (quoted in Clark, 459) Stanton would eventually write to Secretary of Defense Robert S. McNamara to complain about Blue Book's handling of the case. Stanton passed copies of Weitzel's and Judge Cook's letters to the Air Force Commanding General, asking for further investigation of the UFO chase. Two weeks passed with no reply, and a frustrated Stanton then went to The Pentagon himself to speak with Air Force Lt. Col. John Spaulding (who was Chief of the Community Relations Division). Spaulding agreed that Blue Book should have sent an investigator to the scene, and promised that an investigator would arrive there shortly. On May 9, Quintanilla telephoned Spaur to schedule a meeting for the next day. Spaur agreed, but then telephoned Weitzel, asking him to come to the meeting with a tape recorder, suspicious of Quintanilla, Spaur wanted an accurate record of the conversation so that he could not be misquoted. They tried to get Panzanella and Huston to attend the meeting, but neither was able to do so. However, twoBeaver County Times reporters and NICAP member Dave Webb were in Ravenna on May 10 for the interview. Quintanilla would later describe the meeting as "unpleasant." Quintanilla quickly asked Weitzel and Webb to leave, and the reporters left without being asked. The tape recorder remained, however, and recorded a heated conversation where both men essentially repeated their conclusions: Quintanilla argued that the men had misidentified an Echo communications satellite which had followed roughly the same direction as their purported UFO, then they'd mistaken the planet Venus for the same object; Spaur insisted that this explanation was absurd, especially given his assertions that he and the other police had seen a large, clearly defined metallic object which was sometimes only 50 to 100 feet above the ground. Eventually, Weitzel, Webb and the reporters were readmitted to the meeting. Weitzel and Quintanilla got in an argument when Weitzel opined that the satellite/Venus explanation was inadequate, and that it contradicted the accounts of several civilian ground witnesses. Quintanilla admitted that he had never heard of any civilian ground witnesses. Shortly thereafter, Quintanilla left the meeting. I cannot agree with the evaluation publicly released [by Quintanilla] a few days after the sighting. What you reported to me could not possibly lead to such a conclusion: a satellite satisfies none of the characteristics of your reported object. As a matter of fact, Dr. Hynek agrees with this. He was not consulted before this news release was put forth ... I now understand that you and other witnesses did notice Venus and the Moon, and saw the object in motion relative to them, as well as being able to see a shape [to the UFO]." In fact, not long after Powers wrote his letter, Hynek publicly disagreed with the Blue Book conclusion, which was more evidence of his growing frustration with Blue Book. Hynek was one of several critics who suggested that Blue Book should reclassify the Portage County UFO as an "unknown." Another critic was Dr. James E. McDonald of the University of Arizona, an atmospheric physicist and UFO investigator. After detailed research, he too rejected Quintanilla's explanation as implausible. During a meeting with Quintanilla, McDonald would record in his diary that he said he forwarded to the Air Force "information that proves the huge UFO which Deputies Spaur and Neff chased from Ohio to Pennsylvania couldn't have possibly been an Echo satellite and Venus! What do you plan to do about that?" According to McDonald, Quintanilla responded, "I'll change it to 'unidentified.'" However, Blue Book never changed their conclusion, and recorded the Echo/Venus theory as the "official" explanation for the UFO chase. I hope I never seen him like he was after the chase. He was real white, almost in a state of shock. It was awful. And people made fun of him afterwards. He never talks about it any more. Once he told me, "If that thing landed in my back yard, I wouldn't tell a soul". He's been through a wringer. Sure, I quit because of that thing. People laughed at me. And there was pressure. You couldn't put your finger on it, but the pressure was there. The city officials didn't like police officers chasing flying saucers. Something happened to Dale, but I don't know what it was. He came home that day, and I never saw him more frightened before. He acted strange, listless. He just sat around. He was very pale ... He'd just disappear for days and days ... Our marriage fell apart. All sorts of people came to the house. Investigators, reporters ... They hounded him right into the ground. And he changed. Six months after the UFO chase, Spaur had separated from his wife, and was located by John de Groot of the Associated Press. Living in a $60 a week motel in Solon, Ohio, Spaur was nearly destitute, earning $80 a week as a house painter, and sending $20 a week to his wife, and was subsisting on a bowl of cereal and a sandwich per day. 4. Cone tilted toward rear, of direction of motion, more so than shown here. FURTHER NOTES: On Spaur-Neff joint signed testimony: Until over a week after the sighting, Neff was "in hiding," refusing to be interviewed by anyone. I typed a summary statement for Spaur to take to him, along with Spaur's drawings. Neff finally agreed to be interviewed on on April 28. I mailed the statements and drawings to Spaur; there was some confusion as to who was to sign the extra space; Spaur did this, so Neff signed elsewhere on the sheets. According to a Free Time article published October 25, 2006, Dale Spaur moved to West Virginia in the early '70's. While working for a mine, he stumbled into an open shaft and broke his back. A nurse that examined him at a local hospital claimed that Spaur was possessed by an alien and would not stay in his room. When he recovered, Spaur retired to Lakewood, Ohio. He purchased a bar there called the Avenue. He died in 1983. In his 1972 book, Hynek discussed the Portage County UFO case at length, arguing that it was not only unexplained, but also a glaring example of Blue Book's lackluster debunking. Hynek was a consultant for Spielberg's Close Encounters of the Third Kind movie and the Portage County UFO chase almost certainly influenced a UFO chase scene in that movie.